Customer wanted to upgrade his ISA 2006 server to “new” TMG 2010. I thought it would be nice and easy process. It could be if there were no problems which I didn’t expect to be a problem in “new” software. Old server was still functional and I wanted to prepare new server and migrate all settings and certificates. To install all requirements you can install required packages by yourself or you can use Run Preparation Tool from installation screen of TMG. Why didn’t they include it into installation package it self? This was really dump error. 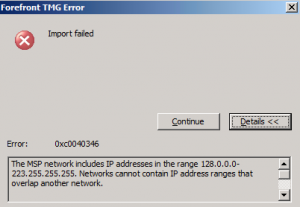 TMG Management Console does not work on Internet Explorer 9.0+. 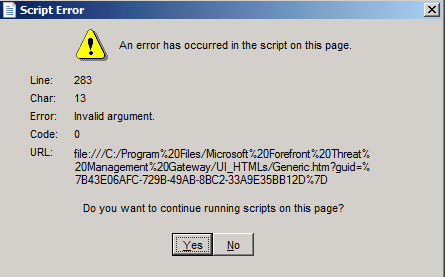 You need to comment out all lines containing word “paddingBottom” (there are three such a lines) in file C:\\Program Files\\Microsoft Forefront Threat Management Gateway\\UI_HTMLs\\TabsHandler\\TabsHandler.htc. Last step was to migrate IP addresses from old server using netsh.